Both Shia and Sunni Muslims hold that the practice of 'Salat', (the reciting five times daily of devotional prayers) is the central tenet of Islamic faith after 'Shahada', the initial declaration of submission to the one God - Allah. On top of the five daily prayers ('Fard Salat') , which are compulsory, the 'Wajib Salat' are performed on special occasions, such as Ede and failure to partake in their recital renders one a sinner. Sunnah Salat and Nafi Salat are two further forms of devotional prayer that can be recited at specific times and which are optional. The intense concentration and ritual nature of Salat makes it comparable to many forms of meditation, and due to this nature may render meditation practice aside from prayer unnecessary for a full committed Muslim. However, the practice of meditation aside from the practice of Salat has its supporters within Islam, many of which point to positive role that meditation plays in helping to calm the mind. This is a gift that, arguably, God has bestowed upon man and can therefore be used wisely. However, detractors sometimes point to the fact that meditation can lead to partaking in rituals and practices not prescribed by the prophet Mohammed, and which may therefore distract Muslims from their duty to God. A difficulty arises here as there is no strict hierarchy in the Islamic faith, with all Muslims adhering to the Koran, which they believe to be the word of God communicated by their prophet Mohammed. In this case it is possibly best for the individual Muslim to focus come to an agreement in themselves of where the Koran stands in relation to meditation. Sufi Islam is a wide definition referring to Islamic groups who do not adhere in their entirety to either Shia or Sunni practice. There are many different groups that fall under the banner of Sufism, making the name itself possibly inadequate as spiritual category. However, for now it will suffice to say that meditation other than the Salat is central to the practice of many Sufi Muslims. By meditating, these Sufi's aim to reach an awareness of their oneness with the universe, believing that in doing so we can attain fundamental truths that are within us, but often remain hidden. These belief's are close to Buddhist and Yogic practices and this may be accounted for by the proximity of many Sufi groups (in the far Middle East) to India. Sufi meditation is sometimes called Muruqaba which means 'to watch over one's soul'. By partaking in Muruqaba, one is able to develop along their spiritual path by developing a better awareness of their self in gradual stages ascending through into an awareness of the Universe and then of God. The final aim of Muruqaba is for the individual to become extinguished within God (Fanah Filla) before returning to their original state, but with their new knowledge of God and their place within the Universe. This is an egoless state much the same as that attained through Buddhist enlightenment. Many Sufi's who reach this state are capable of great creative acts, through which they can communicate the will of God. As stated earlier, Sufism is a very wide category and, furthermore, one rejected by many other Muslims. 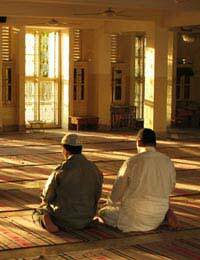 The identification of a trend towards Eastern style meditation practice within Sufism does, however, point to the fact that meditation may find its place in Islam either in this capacity, or as part of daily relaxation practice aside from the Salat, which, indeed, can itself be considered a form of meditation. its' a knowlagable article but i want to know who is the author of "islamic meitation" article here? ?